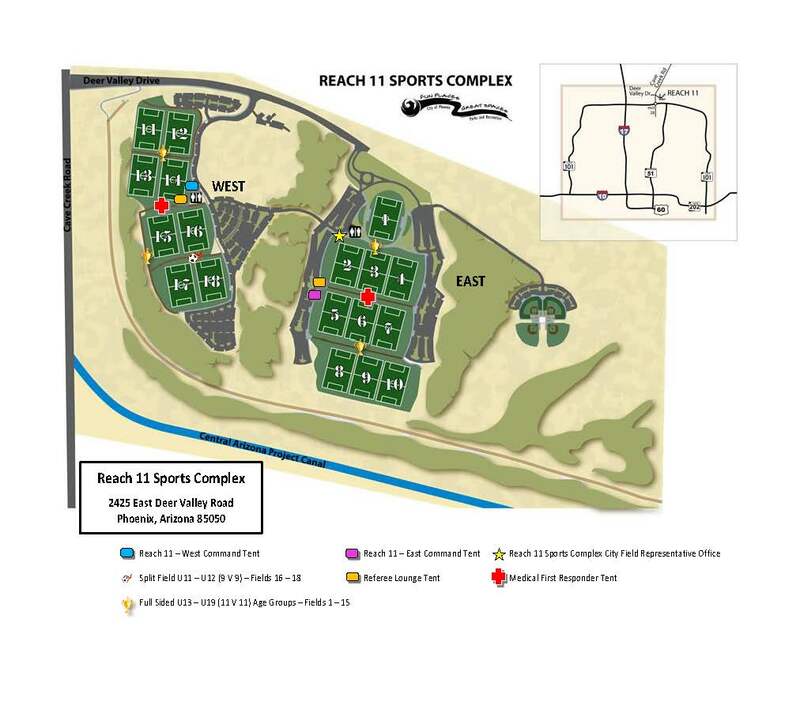 Driving Directions for The Reach 11 Sports Complex - Take Loop AZ - 101 East or West to the North Cave Creek Road Exit (Exit 28). Take Cave Creek Road North to Deer Valley Road. Head East on Deer Valley Road. The Complex Entrance is on the Right. 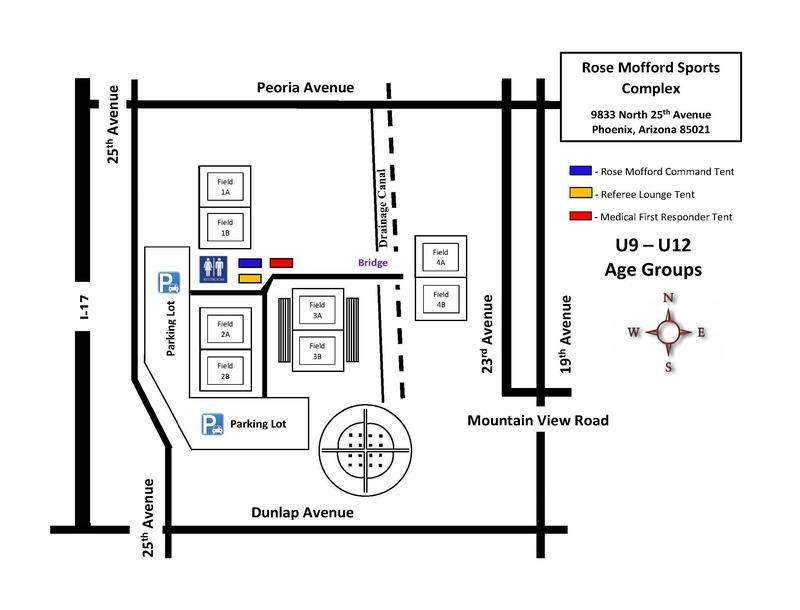 Note: The Complex Entrance is to the East of Cave Creek Road and has two (2) Entrances. The East Entrance is for Fields 1 through 10, the West Entrance is for Fields 11 through 18. 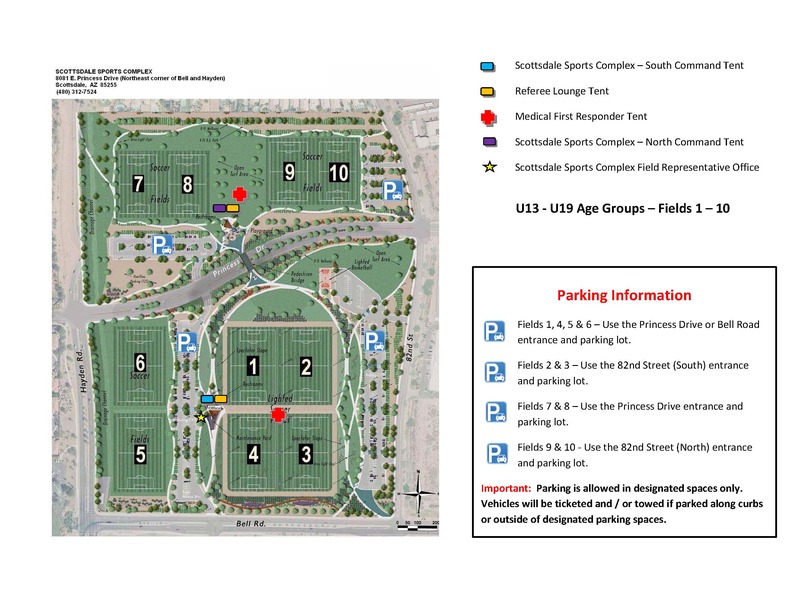 Driving Directions for The Scottsdale Sports Complex - Take Loop AZ - 101 North or East to the Hayden Road Exit (Exit 35). Head South on Hayden Road to Princess Drive. Head East on Princess Drive. The Complex is on Both Sides of the Street. Fields 1, 4, 5 & 6 - Use the Princess Drive or Bell Road entrance and parking lot. Fields 2 & 3 - Use the 82nd Street (South) entrance and parking lot. Fields 7 & 8 - Use the Princess Drive entrance and parking lot. Fields 9 & 10 - Use the 82nd Street (North) entrance and parking lot. Important: Parking is allowed in designated spaces only. Vehicles will be ticketed and / or towed if parked along curbs or outside of designated parking spaces. 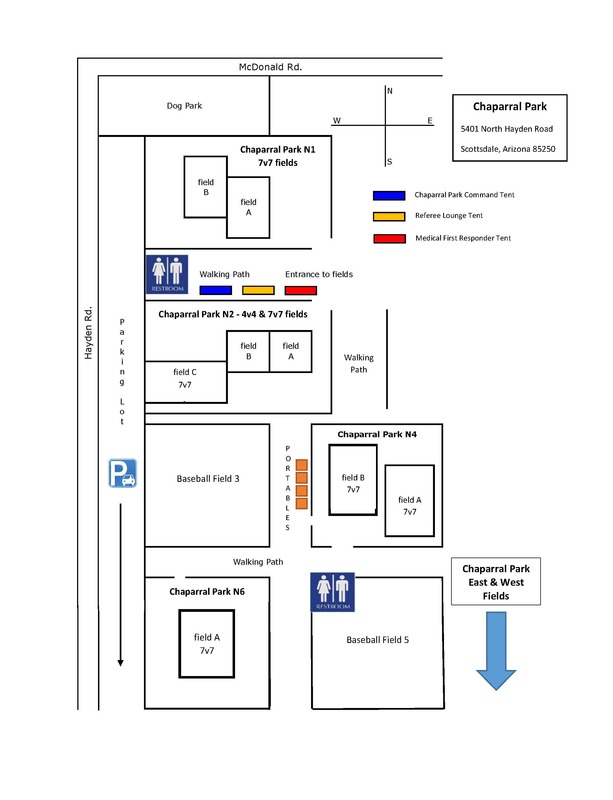 Chaparral Park is a very busy public complex and parking can be extremely limited during high use events. Please allow yourself enough time to find parking which is available throughout the park but not necessarily next to the tournament fields. 2019 CRITICAL UPDATE: Due to parking lot construction and storm damage, a section of the parking lot at the Hayden Road / Jackrabbit entrance that runs along Hayden Road will be closed to parking. Please plan ahead to allow yourself enough time to park. Carpooling is highly recommended.